I first joined Roller Derby in in April of 2010 when the league was first discovered. Sarah Humphrey was my Assistant Manager at this time and informed me her and her friend Bry were going to start a Roller Derby league in Saint John. Having played various sports growing up such as soccer, basketball and track and field I thought why not try this sport I have never heard of! Sarah brought me in an old pair of skates the next day. These skates had to be from the 80’s. They were white, laced up past my ankles and had plastic purple wheels. I immediately put them on in the back parking lot of Lancaster Mall and started skating around. As a kid I skated on inline roller skates A LOT, the Quads felt different to me but manageable. It immediately brought me back to my childhood. I loved skating up and down City Line (The most hills on the West Side). My brother and I used to set up obstacles to jump over and made road ways out of chalk. That weekend I went to my first Roller Derby practice. At this time there was no Learn To Skate, as long as you had a pair of skates and the proper equipment you were on the team! We were broken up into four teams of color, I was on the Pink team. The colored teams lasted a short amount of time until we were eventually split up into just two different teams. The Razor Girls and Scarlett Swarm! I was put onto Razor Girls. At the end of 2011 the Shipyard Sirens travel team was formed, there were tryouts and I was selected to be on that team. 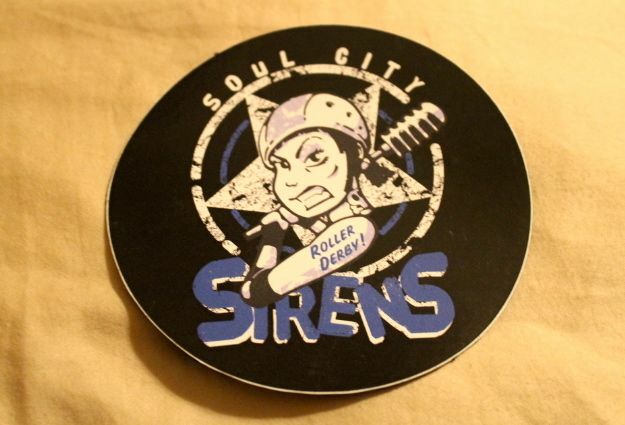 I played on both Razor Girls and the Shipyard sirens until the beginning of 2013 where I made a personal decision to just be a member of the Shipyard Sirens. In 2014 Team New Brunswick was formed. Today I play for both the Shipyard Sirens and team NB and have the honor of being the Co-Captain of the Shipyard Sirens this season. Roller Derby to me has been somewhat like a relationship. What does that even mean you ask? Well, it’s like I have had this boyfriend for the past 5 years who I can’t live without who I love so very much, like I’m afraid of what my world would be like without this person because I’ve grown with them and they are a part of who I am. At the same time sometimes I want my space and to just do things for me without Derby. I get wore out and tired of putting effort into the relationship sometimes and want to give up. The honeymoon phase and novelty have worn off now you decide if you want to proceed with your relationship or give up. It’s not always easy but neither is anything worth having in life. You need to work for it every day, strive to be what you want to be. I am a true believer that you can do anything you want to do. My first day on skates I said to Sarah “ I am going to be a Jammer”. Guess what? I’m a Jammer, because I believed that I could be. This quote below by Michael Jordan is what I live by, It has inspired me to do so many things. Roller Derby is more than just a sport to me, it is my support, my shoulder and my crutch. The people I have met on this journey come from all walks of life and it truly amazes me how this one love has brought us all together. I have met some of my dearest, closest friends over the past 5 years and I have shared so many amazing moments with these people. Roller Derby truly has saved my soul, over and over again and I will continue to depend on it to do so until I physically can’t any more. NRGB – A snap shot of where we’re at.